When Maria at Trilingual Mama started a blog link-up party about wedding traditions around the world, I realized that I never really wrote much about our German – Latvian wedding. My original post written two years ago was short and sweet, now comes the extended version on how we negotiated two quite different ways of doing a wedding and three different languages to make our big day not only memorable but also a lot of fun for us and our guests from 10 different countries. Let me start by briefly describing how a typical wedding is done in the two countries. In Germany a wedding often has two parts. The couple is formally wedded at the registry office (Standesamt) in a small circle of closest family and friends (and I really mean small, most places won’t fit more than 10-15 guests). If they wish, this is followed by a church wedding either on the same day or on a different date which is attended by a larger number of guests. The wedding ceremony is followed by a small reception and a party that is commonly done in a hotel or a restaurant. The typical wedding party package is eight hours, if the newlywed want their celebration to last longer they have make additional arrangements. 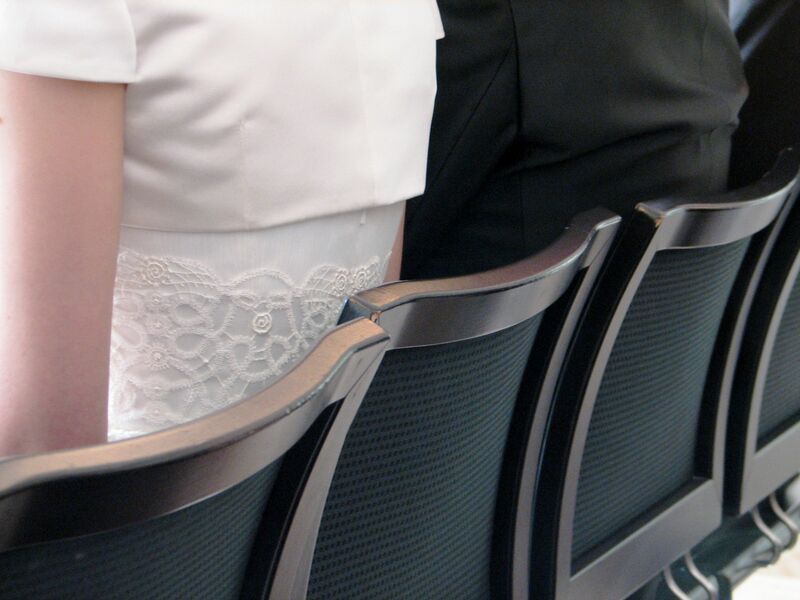 In Latvia there is only one wedding ceremony and the couple choose between the registry office and the church. Contrary to Germany, all wedding guests attend the ceremony independent on where it takes place. After the ceremony there is a small reception and then the guests set out to drive to the location of the party, often stopping by different places where the newlywed have to pass various challenges to prove their compatibility for the life together. The party is most commonly thrown at a guest house (or sometimes an old mansion) where accommodation is provided for all the guests. Everyone eats, drinks, and dances as long as they wish, have a good night’s sleep, wake the newlywed in the morning, have a hearty late breakfast, and then make their way home. Comparing the two ways of doing a wedding we quickly realized that we have some problems if we want to have a Latvian-style wedding in Germany: where do we find a registry office that can host more than 20 people? How are we going to organize transport from the ceremony to the party location for all the guests who will fly in from across Europe? Is it even possible to have all the guests stay the night without going bankrupt? Clearly, some compromises and adjustments needed to be made. We were lucky to find a location that was not only a beautiful place for a wedding but also helped to solve many of the potential problems: the Lür Kropp Hof on the outskirts of Bremen. The Lür Kropp Hof is a 19th century farm with beautifully renovated old buildings and a special wedding house where the local registry office performs wedding ceremonies. This meant that we can invite around 40 guests for the ceremony, have our post-ceremony reception in the adjacent park area with the rest of our 80 guests joining in, and then walk over to the former horse stables for dinner and dancing. When our ideal wedding place was found, the next question was: which wedding traditions do we want to include? Conveniently, many traditions are international and done both in Germany and Latvia, e.g., carrying the bride of the doorstep, having a first wedding dance, or throwing the bridal bouquet. Furthermore, we soon discovered that several of the Latvian wedding traditions are surprisingly similar to old and partially forgotten German ones. Let me tell you about some of the more interesting wedding traditions that we incorporated in our wedding! As already mentioned before, a typical Latvian tradition is to give a few challenges to the newlyweds. These are called the “gates” as they often symbolize the stages of life left behind, as well as forecast the things to come. The number of the gates depends on the imagination of the organizers; the tasks in each are associated with the theme of each gate, e.g. there can be a childhood gate, a youth gate etc., often the newlyweds are made to show their skills in tasks needed in the married life. All in all, the purpose of these tasks is to test the teamwork skills of the new couple and to provide a good laugh for all the guests. What were we required to do, you might ask? My memory is a little foggy but I do remember attempting to dance a folk dance from my childhood, coming up with 20 or so sweet nicknames for one another, telling an embarrassing story from our youths or childhoods, and making promises that we shall fulfill in the first decade of our marriage. Let me tell you a little secret: hubby promised to learn Latvian. If you notice during the wedding that the new husband does not leave the side of his wife there may be other reasons than just wanting to be near her. If one is not careful, some of the kind guests may steal her away which means that she either needs to be quickly found or bought out by doing whatever the thieves demand. So better be careful and make sure that she does not leave your side until midnight! While both Latvians and (South) Germans practice stealing of the bride, the way it happens is a little different. In Germany she is usually taken to a restaurant or a bar nearby where she spends her time until the groom finds her (and when he does, he’s the one paying the bill). In Latvia the bride is never taken far and tasks for returning her to the groom are promptly decided on. My hubby is the biggest fan of stealing the bride, he even helped to organize it once! But, of course, he was determined not to let it happen to him. That said, my Latvian friends were just as determined to make it happen. They even recruited my mom to carry out one of their plans! After many hours of failed attempts they finally succeeded while the freshly baked husband had briefly left me in the custody of my sister-in-law to get a drink at the bar. You know what she told him after the poor man had mixed several drinks and even performed a song under the scrutiny of a jury to get me back? Had I known that this will be so much fun I would have let them steal her much earlier! According to Latvian wedding customs, midnight is the point when the newlyweds say goodbye to their unmarried life and truly become husband and wife. The name “mičošana”comes from an old Latvian word for “hat” and symbolizes taking off the wreath (worn by unmarried women) and putting on a married woman’s headdress. The events taking place at midnight vary from one wedding to another and can include lighting candles, some traditional songs, and changing of headdresses for both bride and groom, among others. On our wedding this typically Latvian tradition was followed by several international ones: I threw the bridal bouquet and hubby threw my garter to determine who from the single people will marry next. Afterwards the wedding cake was served which we, the newlyweds, had to cut together. By German custom, you should always note whose hand is on top – that one will have the say in the marriage! According to our North German wedding caterer, the wife should let the husband put his hand on top but meanwhile step on his foot under the table to show who will really have the upper hand in their future together! Did I do it? As we say in Latvian, the history is silent on that matter. As our relationship, also our wedding was trilingual with several of our guests speaking and understanding only German, Latvian, or English. Because of this, we asked two of our friends to help with translations to make sure that everyone understands what is going on. Of course, we also had to adapt the seating arrangements to the languages spoken so that people sitting at each table have at least one common language. While this lead to some inventive combinations of guests, it worked out perfectly and even resulted in some new friendships! beautiful pictures, looks like an awesome wedding! This is fabulous! I love the concepts of “gates” and “kidnapping the bride” – adds a fun atmosphere to the festivities. Thanks for sharing this post with me. Love it! This blog content is really very informative. Comparing the two ways of doing a wedding we quickly realized that we have some problems if we want to have a Latvian-style wedding in Germany: where do we find a registry office that can host more than 20 people? Thanks allot to offer such kind of post.